Jeremiah 1:5 states: “I knew you before I formed you in your mother’s womb. Before you were born I set you apart and appointed you as my prophet to the nations.” It is in this scripture that we see God’s fondness and admiration for the unborn child. Before our birth, God had a master plan for us to fulfill. This serves as one of the main arguments for the pro-life cause. The advocacy for the life of the unborn child is in harmony with God’s heartbeat for those who have yet to take their first breath. Every life is precious and deserves an opportunity to live its life to the maximum potential. The film “October Baby” takes you inside the life of a high school student named Hannah, who founds out after a serious medical scare, that she was adopted after being on the failing end of an attempted abortion. Hannah goes on a quest to face her birth mother for the first time and to seek out the truth regarding her mysterious life. As you can imagine, anger, hurt, frustration and bewilderment became the new norm for Hannah. The feeling of being neglected became Hannah’s world. Whenever she saw herself in the mirror, she saw anguish, bitterness and fear. She viewed herself as a mistake and pondered the reason for her existence. “October Baby” served as a harsh reminder of the cruel reality that there are those who view the unborn child as a non-necessity and as punishment for an unwanted mistake. There are many who view pregnancy as an obstacle instead of a blessing. We live in a society where it’s easy to abort the unborn child, but easy to indulge in a reckless lifestyle without adhering to the consequences. In viewing “October Baby”, one is comforted in the fact there are those who are convicted with the fact that true love outweighs all negativity and circumstances. While the liberal ideology tells women that abortion is a choice that should be embraced, there is a positive alternative that encourages adoption or simply keeping the child. 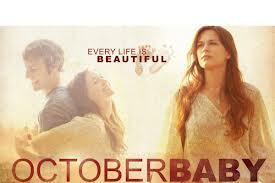 I would highly recommend “October Baby” to every person who reads this. We must all be solemnly reminded that the sanctity of life is a God-given conviction that must abide within our hearts and souls. President Ronald Reagan once said, “I’ve noticed that everybody that is for abortion has already been born.” If you’ve read this, you are the beneficiary of life. I compel you to want the innocent to have that same luxury. I’m proud to be pro-life too! Jesus said we should care for the least of these, and the very least of these–the most vulnerable–are the unborn children. I will check out the movie if you recommend it.